Get the natural healing of hematite with designer acrylic beads. 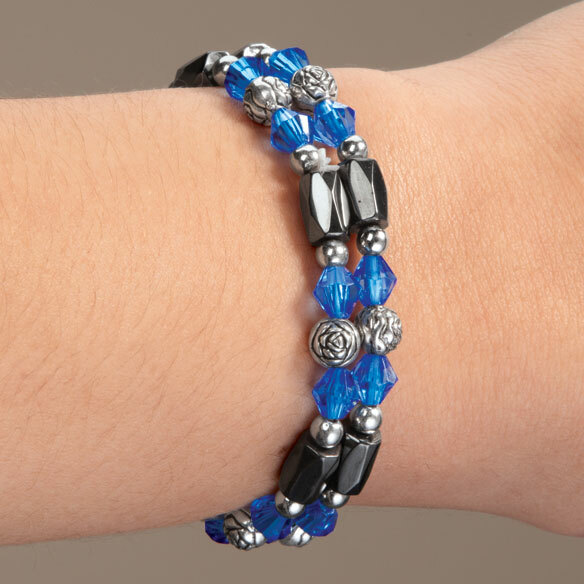 The magnetic mineral hematite is believed to relieve aches, stress, insomnia and more. Set of 2. Elastic design fits most. 7 1/2"L x 1/4"W x 1/4"H.
I have both osteo and rheumatoid arthritis in my hands and my wrist, especially my right wrist, which was broken at one time. After wearing a set of these bracelets, on each wrist, I noticed after a few days that I had less swelling and pain in both hands and wrist. In fact my wrist that had been broken would swell and hurt on a daily basis, but after wearing these bracelets, I seldom have swelling anymore and the joints in my fingers are much less painful and don't cramp hardly at all anymore. Their lightweight, so i am able to wear one on each wrist through the night, which is part of the reason they continue to work through the day so well. I also have trouble with pain and stiffness in my neck, so I decided to use a set as pony tail holder and now i am having less trouble with my neck also. The only draw back to these are that they are a bit fragile and probably have to replace about every six months. Part of this is i'm sure, because i wear them 24/7. for the price they are and the results you get they are well worth it even if you do have to replace every so often. I have also decided to take apart the older bracelets and restring them, to make a anklet. I have nerve damage from having blood clot in my foot and poor circulation, so i'm hoping it will help that too! This provided gifts for 3 dear friends and myself. Great design and neat bracelet. I like that it came in the color I wanted. Really helps w/pain from tendinitis. An absolute "must have" at time working in office w/computer, ets.. I use it like a bracelet . It fits good. Bought two red sets, and wore all on one wrist. They look pretty and may serve their purpose. cost more to send them back than the price I paid. Threw them in the trash. another catalog had these same bracelets but a few dollars more. so i got these and should not have because they are smaller and do not fit my wrist loosely the way i like them. now i have to spend money to ship them back. very dissapointed.....i will not order from your company again. I am trying this bracelet for the time to see if it really works. Nice looking. Will it work? Good price. It is suppose to get rid of pain. They have proven to help me. these work. But break after awhile need more. Hopefully will help with pain connected to multiple carpal tunnel surgeries. They are very pretty. I liked the color combinations! To see if it will help or not. I purchased it because I liked the look of it, no other reason. I like the style of these bracelets. Also, I believe in the magnetic healing quality. The hematite bracelets make me feel better and I have more stamina throughout the day. I like Hematite (magnet) and Rose Quartz. Easy to put on when you have arthritic hands. goes with an outfit I have. I like bracelets in the summer and these are pretty. I just thought they looked pretty. I got them in everycolor they had. UPDATE: After wearing the red bracelets once, I saw the color had come off on the inside of my wrist.